We are working to provide the facilities our students need to succeed in the 21st century. Follow milestones in our progress. It's been a busy fall! Next month, we'll welcome students into Silverdale's new wing. We're making a lot of progress toward completing big projects this school year! Construction is complete. Students and staff love their new spaces! We’ve accomplished a lot this school year, and we’re gearing up for even more work this summer. CK Schools begins road improvements to improve access to the new CK High & Middle. Silverdale will have five new classrooms. A major phase of our work to secure access to schools begins. A new, major phase of work has started. Two campuses reach major milestones as steel arrives. It's been a busy year improving facilities for our students! New walls are now visible at all three of our school construction sites! Completion of this building fulfills the last major project promised to our community with the 2011 capital projects measure. Work is on time and moving fast! School and classroom design can impact student achievement. We're making progress on our major school construction projects. Alissa Capuano helped in the demolition and preparation work to rebuild the OHS core. Students, staff and community celebrated the start of construction on campus. This month marked the beginning of a new era for Klahowya athletics. School starts for the first time on Sept. 6. The work on the middle portion will make way for a two-story replacement. Students, staff and dignitaries officially break ground. Contractors for major construction projects reach out to local businesses. A major milestone clears the way for construction document preparation. Get a summary of our past year's Capital Projects accomplishments. As part of the design process, a revised floor plan design was presented to the board. CKSD keeps its promise to build a new facility to consolidate services. Families and community are invited to ask questions Dec. 6. See designs for the new CK Middle and CK High. Tell us what you think! Read More About Join Us Dec. 6! Students celebrated their new school with a ribbon cutting. Projects throughout the district improve safety. Want a Sneak Peek of Oly’s Remodel? Central Kitsap School Board approves first phase of design work. Read More About Want a Sneak Peek of Oly’s Remodel? School staff have been hard at work readying the building for students. New classrooms, new roof and other work is just the start of improvements at Klahowya. Woodlands gets a new sprinkler and fire alarm system. Community support improves middle school tracks. Architects wrap up an information-gathering phase before sketching layouts for the new schools. Board members considered and voted on initial sketches and floor plans. The district is preparing for four major construction projects. Workshops and staff meetings guide design for new schools. The design process is moving quickly for the addition at Klahowya Secondary. Staff and students at one school reimagine their existing and future spaces. Thank You Central Kitsap Community! The passage of a bond and levy measure for our schools has been certified. Read More About Thank You Central Kitsap Community! Three years into the levy, we have made significant progress on promised projects. The renovation and modernization project is on time and on budget with the school set to reopen in fall 2016. If smiles are an indication, Hawk Elementary at Jackson Park students believe their new playfield was worth the wait. If you've gone past Silverdale Elementary lately, you may not recognize it. On their last day of school, students at Silverdale Elementary celebrated more than just the end of a school year. They also took some time to celebrate the start of something. A week after school let out, staff and moving crews boxed up everything inside Silverdale Elementary. Students and community leaders hailed the opening of John D. "Bud Hawk Elementary at Jackson Park in September 2014. 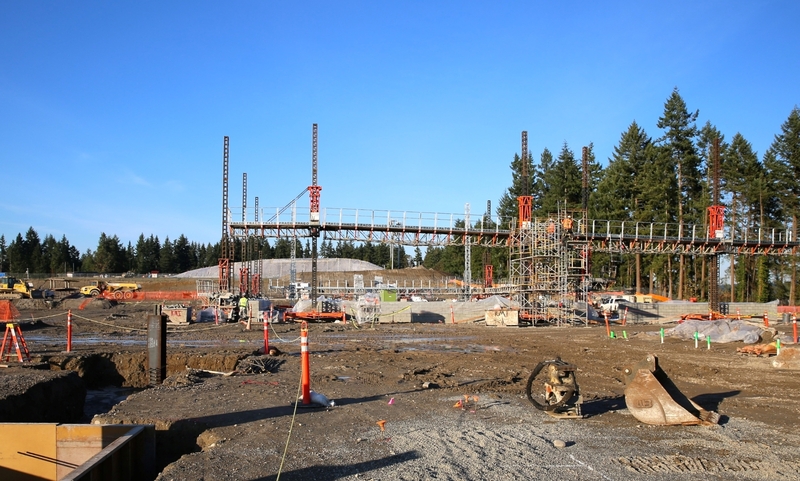 The school's construction was the largest project we promised when Central Kitsap voters approved the 2011 capital projects levy. The district broke ground on the project in June. Since then, students have been watching the new school take shape right before their eyes. Read More About Jackson Park Elementary School Takes Shape! Central Kitsap School District is scheduled to break ground in May on the long-awaited replacement building for Jackson Park Elementary School.